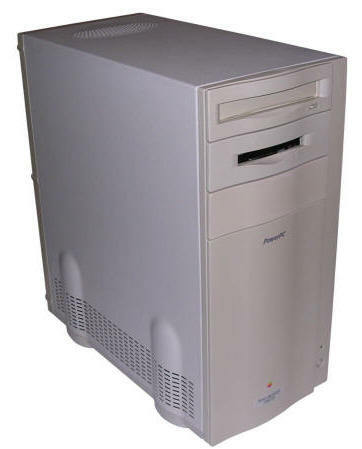 This computer, introduced in 1995, is a very revolutionary Power Mac. Previously, Apple used their own NuBus slots for expansions and the video chip was usually built into its mainboard. Here, there is no built-in video chip and graphics board can be installed in one of 6 PCI slots. By default, Apple's accelerated video board with 2MB of VRAM was installed but quickly third party companies released their own Mac-compatible boards. Previous Macs were equipped with no network interface or only an AUI connector. This Mac has a 10-MBit network interface with RJ45 socket on board. The processor, fast PowerPC 604, is installed on extension board, so it is possible to replace it with an upgrade. In late 1990s there were upgrade CPU boards for it even with G4. 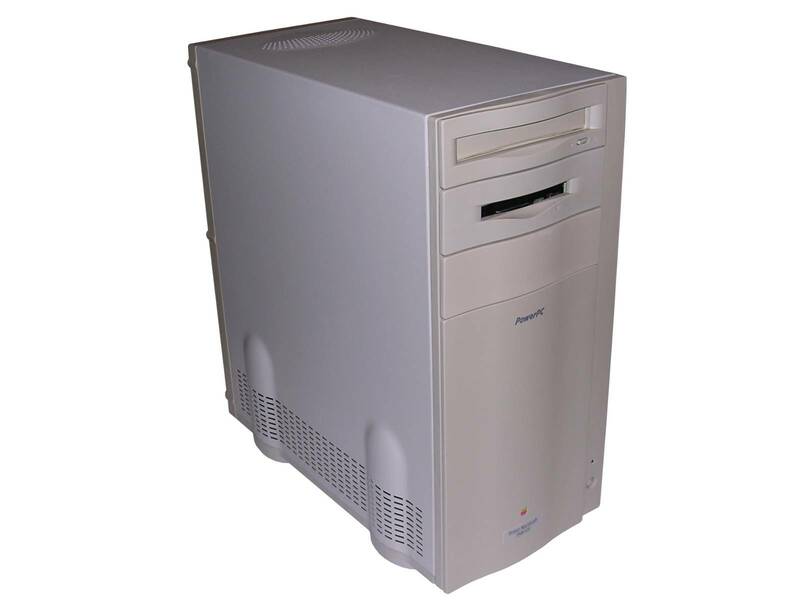 This Mac has a tower casing as many professional Power Macs. 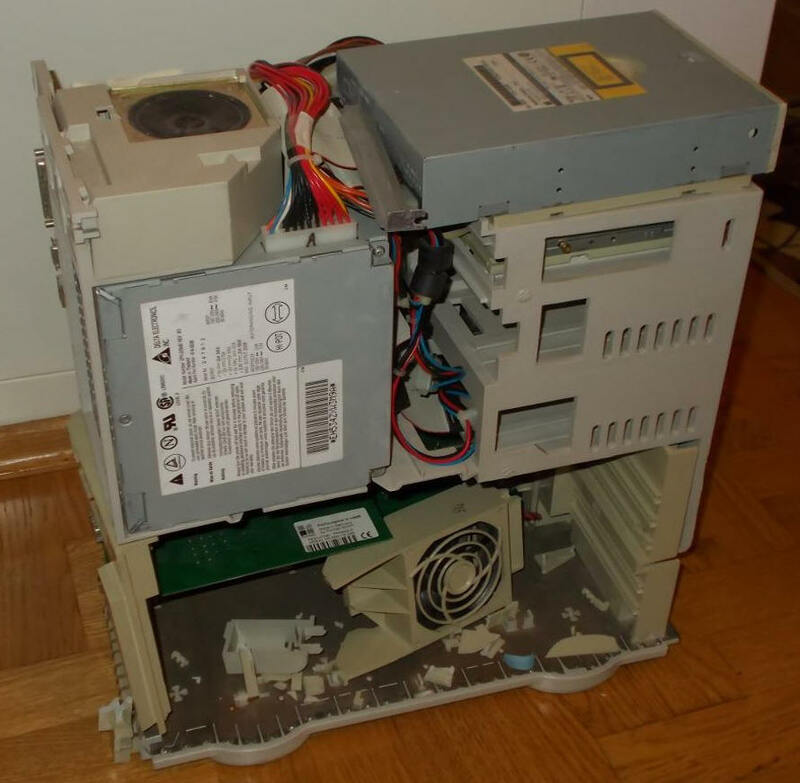 Inside there is a space for a CD drive, floppy and maximum 2 SCSI hard disks. The most expandability was made by PCI slots. As a memory, Apple used a specific 5V DIMM modules rarely used in later computers. This DIMM module, however, still contains FPM 60ns chips. These times DIMM was not standardized so strictly and it was in fact more a form factor than electrical standard. Additionally this Mac has CUDA predecessor chip, with less functionality. Such Mac was in its time a high-end computer and its price was higher than typical Macs. It was bought mostly for design and multimedia studios and for some scientific computation. 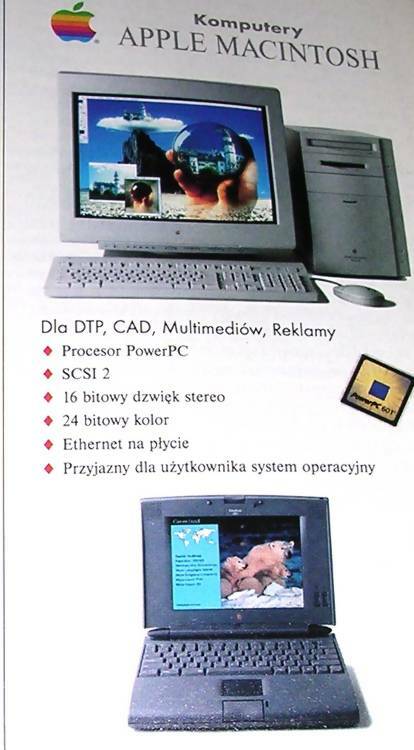 Display: External, 15-pin VGA connector (like a PC). My unit has been bought in Germany and it's one of the early units from 1995, it has even creators signatures etched on plastic (later units had them less readable because of tool wear). By the end of 1990s it has been significantly upgraded: The CPU has been replaced with Newertech G4 board and the RAM has been bumped up to 128MB with two SIMMs. Additionally, a better video board has been used with 100MBit network board, also in PCI. 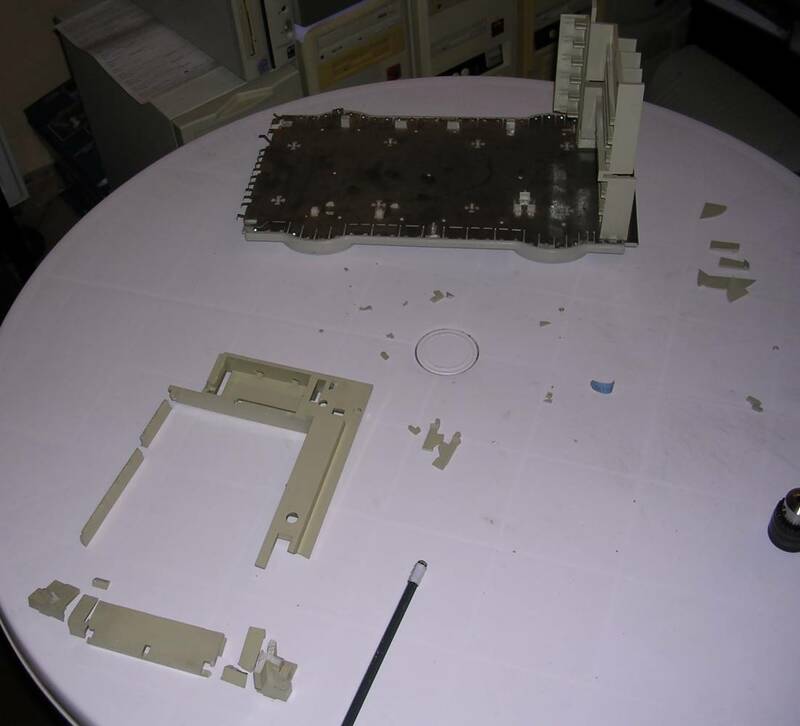 To connect parts, I have used a solution of ABS in acetone, with a small amount of ABS. Acetone doesn't dissolve ABS quickly, it rather makes it more viscous. I used the acetone to “weld" parts together and the ABS filings to fill smaller crack holes. After strenghtening the connections with glue I inserted a few metal rods (e.g. from paperclips) into joins using a hot soldeering iron. The connections seem to be stiff enough to keep the computer in one piece. As all Macs it should play its start-up sound and initialize the screen. However there is one interesting caveat not present in many other Macs: If a few seconds after "Bong" it plays the crash sound (like broken glass) it may not mean "memory error" as in official documentation (then you need to check or re-seat SIMMs), but "PRAM error" - read "battery exhausted". It will boot then, so set the time, turn it off by software or power button, but don't disconnect the power, it should start up again without unpleasant sounds. The most important thing here is not to install PC 3.3V DIMM modules (most PC DIMMs) - it should not fit in sockets, but some really can be installed, which will damage the module or memory controller. This Mac is a bit picky about video boards - usually these made for Mac will work. Some specific Mac video boards have significant power requirements and I had problems unning them with current power supply unit. This may not be present in all Macs, but I found that the method to fix it is to replace old capacitors in mainboard's power rail. The problem is that they're surface mounted. 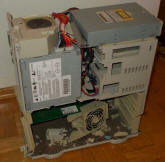 Although through-hole may be used, the better way is to find a surface-mounted ones in old mainboards or CD/streamer drives. The problem of OS installation is that even if it's possible to run 9.2 in upgraded machine, it won't go, because the last supported OS is 9.1. Even if you have plenty of RAM (and when having access to these strange DIMMs you can get easily over 100MB, if not 1GB here) and the PowerPC G3 or G4 upgrade board, this Mac is one of the last with some "Old world" ROM part, and 9.2 is optimized more for the "New world" targeting a bit on the iMacs. To install Mac OS 9.2, you have to use update and OS 9 Helper patch. You can try to use OS 9 helper, upgrading from 9.1 - see its archived home page. The 9.2.1 update package is downloadable here. The 9.2.1 -> 9.2.2 update package is downloadable here. However, I found that with typical, easily accessible 9.1 US these updates do not work at all. The installer just aborts right before start. I think the updates accessible here may work better. As the last resort you can use XPostFacto (if you still have a copy) and go with OS X. However, it's installing a system 6 years newer than computer so better make sure that you want it. At least 100MB of RAM and 300MHz CPU upgrade is a must-have, it's not an iMac you can throw OSX there and it'll more-or-less work - even the fastest CPU upgrade will be bottlenecked by system bus clocking at 50MHz. http://siber-sonic.com/mac/MAXpowrG3.html - MAXPOWr G3 page with DIP settings and manual. NOT a G4. There is not much information about G4 board for this Mac, because a bit later NewerTech introduced much faster G4 boards than 450MHz and they had the biggest support. For MAXPowr board you may need a MAXPOWR driver (for MAXPowr G4 you need MAXPowr205.hqx and StuffIt Expander).